Is MindMaps Different On The iPad? 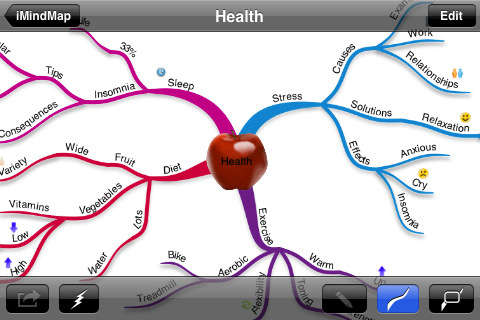 We have mentioned several times how we like to use MindMapping software on the iPad. 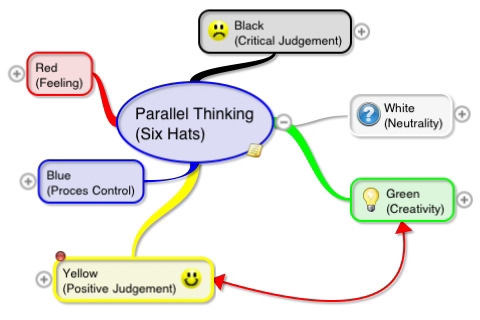 It is great for tracking the flow of thoughts in a meeting. A big hit for us is using the software to map out the As-Is when we are looking to develope replacement solutions. The most recent post brought about a handful of emails mentioning that the MindMapping software we mentioned didn’t look anything like MindMaps they had seen in books or meetings they had. This is true, if your a true to the original design of the MindMap process, the thoughts and decisions are ‘on’ the branches. While, what most developers are delivering as current solutions is actually flow charts – the items being in boxes connected by lines for flow and decisions. When deciding which option is best for you, it is best to start with what desktop software you have. Are you expecting to sync the work your do on the desktop and iPad across to use on both devices. Some MindMapping solutions for the iPad would sync to both styles of layout on the desktop but will the view change and thus creating a missmatch when you try to edit or update. The iThoughts developer has recently added a ‘HD’ version for the iPad screen and feature set. It offers many more robust features for laying out processes and thoughts quickly. Adjustable backgrounds and multiple sharing options are more than most of the other currently available solutions. For meeting purposes, the HD version works very well for zooming in and out allowing for very large diagrams. • Import and Export Freemind, Novamind, Mindmanager, XMind, iMindmap, Mindview and OPML format maps. • Export as PDF or PNG images. 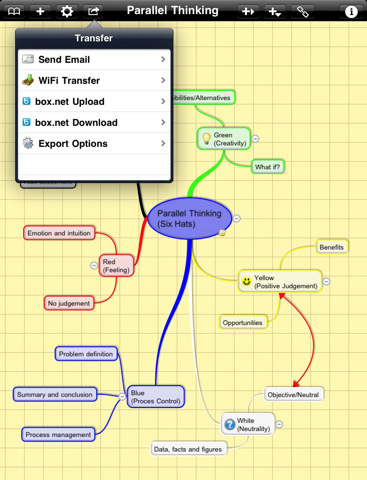 • Wirelessly upload/download mind maps using a web browser. • Open email attachments in iThoughtsHD. • Cut, copy, paste, move and merge topics and branches. • Work in landscape and portrait mode.